If you rely on vision correction in order to see well, you probably find yourself shopping for eye wear in San Fernando Valley more often than you had expected. How you choose to correct your vision is a decision you should make with your favorite Optometrist. Your glasses are both a fashion statement and a necessity for great vision. Dr. Barry Leonard will help you with the right prescription, and his team of eye wear experts will help you pick the perfect style to match your unique personality. That’s why we carry almost 1,000 different frames for you to choose from. Read and see more about our prescription glasses and designer frames here. 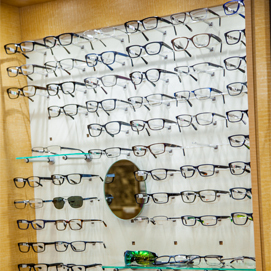 Dr. Leonard's team wants to ensure you find the perfect eye wear in San Fernando Valley. Why travel across town when the best selection is just around the corner? Of course, if you would rather wear contact lenses, we’ve got lots of different kinds for you to choose from. In fact, if you have Keratoconus, special Keratoconus contact lenses may be your best choice for vision correction. Dr. Leonard can personally help you find the best solution, based on his personal experience fighting the effects of Keratoconus on his vision. And if you need help figuring out the best eye wear for you, you probably need an eye exam, and that is exactly what we’re here for. The Office of Dr. Barry Leonard has served the people of the San Fernando Valley since 1957 — a long time. Just because we started in the 50’s doesn’t mean we’re behind the times. We’ve invested in the most modern computerized equipment and that experienced, personal touch, to make sure that your prescription results in the best vision possible for you. Call our office 818-891-6711, or make an appointment now using our online appointment link (at the top of this and every page). We’ll be happy to see you in our office for your very first visit…and for years to come.